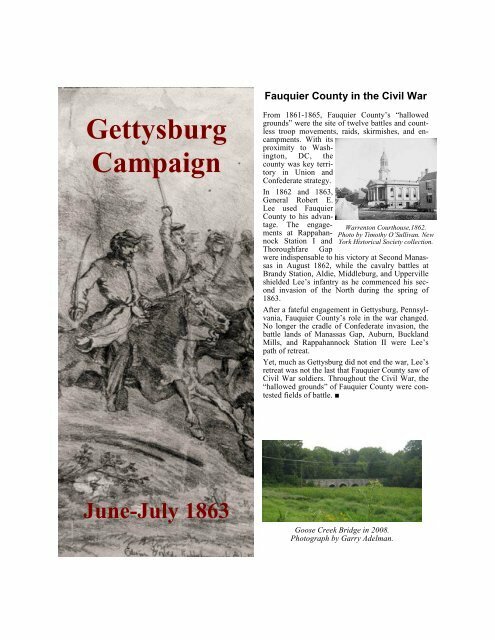 Gettysburg Campaign June-July 1863 Fauquier County in the Civil War From 1861-1865, Fauquier County’s “hallowed grounds” were the site of twelve battles and countless troop movements, raids, skirmishes, and encampments. With its proximity to Washington, DC, the county was key territory in Union and Confederate strategy. In 1862 and 1863, General Robert E. Lee used Fauquier County to his advan- tage. The engagements at Rappahannock Station I and Thoroughfare Gap Warrenton Courthouse,1862. Photo by Timothy O’Sullivan. New York Historical Society collection. were indispensable to his victory at Second Manassas in August 1862, while the cavalry battles at Brandy Station, Aldie, Middleburg, and Upperville shielded Lee’s infantry as he commenced his second invasion of the North during the spring of 1863. After a fateful engagement in Gettysburg, Pennsylvania, Fauquier County’s role in the war changed. No longer the cradle of Confederate invasion, the battle lands of Manassas Gap, Auburn, Buckland Mills, and Rappahannock Station II were Lee’s path of retreat. Yet, much as Gettysburg did not end the war, Lee’s retreat was not the last that Fauquier County saw of Civil War soldiers. Throughout the Civil War, the “hallowed grounds” of Fauquier County were contested fields of battle. ■ Goose Creek Bridge in 2008. Photograph by Garry Adelman.